Easter is close at hand! Our culture tends to highlight Christmas as the biggest day of the year both spiritually and as a time of family gathering. But if we consider the significance of Easter, really, the whole world was changed by not only the birth, but also the life, death and resurrection of Jesus Christ. 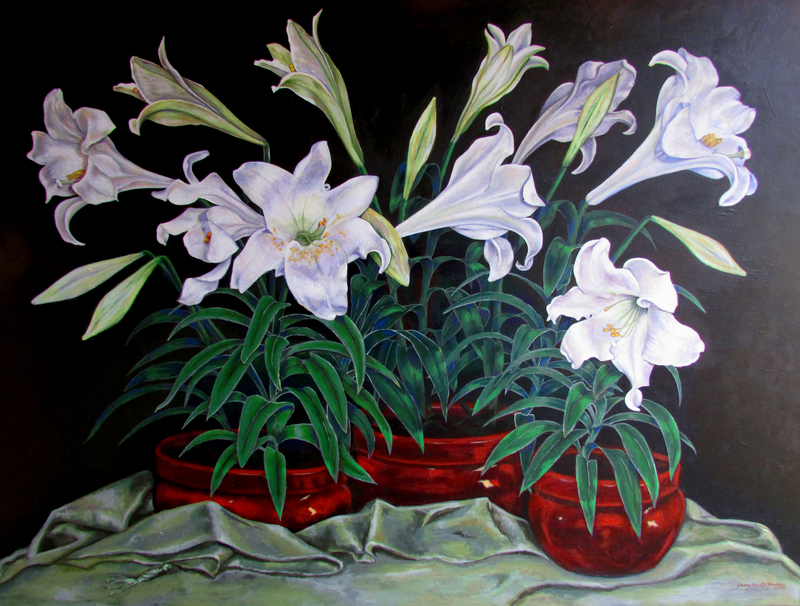 This painting of Easter Lilies is symbolic of the resurrection of Christ – new life. Spring is full of new life – baby lambs, beautiful budding flowers and trees – even the weather in most parts of the country seems to lift and whisper a sigh of relief that winter is over. But far greater is the new life possible because of what Jesus accomplished and His work that continues to this day. Our spiritual lives are even more real than our physical lives. Easter is cause for great exhilaration and celebration! Happy Resurrection day to come.